Finally the trip has started and we are here. The traveling to here part of course didn´t go as planned it never seems to for us. Day 1-2 has actually turned into day 1-3. We left our house at a bout 3 pm on Friday Aug 5th and got to the airport pretty early. So we killed 3 hours waiting for the flight only to discover a few hours in that the flight was going to be late by 2 hours. Not good, we have connecting flights. Doing the math we would still get in LAX in time to walk across to the next gate and board, but it appears that things don´t run that way for the Latin American airlines. So Air Canada gets us to LAX way late and we finally, after delays on tarmac as well, get into the airport at around 12:40 am with just enough time to walk the 40 feet to the next gate and get on right, wrong. I have never seen so many people at one airline gate. They overbooked this flight to what appears to be 4 times more than the plane can hold! Needless to say after a long time talking at the gate and then downstairs at the ticket counter we ended up with a flight for the following day at 1 am. So instantly we are a day behind on holidays. The airline put us up in La Hacienda just a little ways down from LAX. It had a nice bed but its positives ended there. The restaurant, where we had food vouchers, not good, don´t eat there if you can help it. Rooms are basic, clean, but cramped bathrooms and making a local call requires a deposit on your credit card, dumb. We don´t like LAX to start with and now we have to go back and do it all again the next night. Got to sleep finally around 3 am and slept as long as we could. Then we grabbed an unfortunate lunch and took the free shuttle to the mall. This was a family debate as Ryan wanted to go to the beach or hop on the metro and go downtown or something, Lindsay wanted to go to universal studios, at noon, on our $100 day budget. Nuh uh, we took shuttle to a mall as a compromise and of course discovered the whole mall could be done in about 20 minutes. So then the mall concierge, who was way nicer and more helpful than guest services at our hotel were, told us how to walk to the beach. 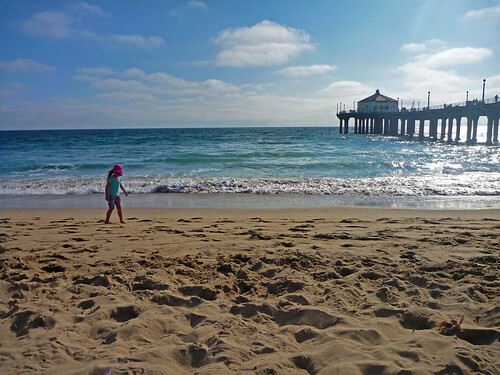 We then headed to Manhattan beach after a small detour when somebody thought going east to get to the ocean made sense instead of going west. Eventually we made it and stopped for a drink in a bar, got ice cream and a lollipop for the lactose intolerant me, and then went and sat on the beach. LA is kinda cold right now. After playing in the surf and drying in the wind and walking back around sunset to the mall we were frozen. Vancouver is actually warmer right now. Nicaragua, not cold, we´ll get there next post. After supper we met up with our cohorts that were also trapped in LA for the night and day and headed back to the airport to try the same trip again. This time we made it on somewhere after 1 am and discovered that this plane was overbooked too, go figure. It´s a different culture down here with air travel. The lineup of old folks in wheel chairs is pretty fun to watch though. Flew through night/morning to San Salvador, El Salvador, even got breakfast (hear that North American Airlines, you can still serve food). Then switched planes and flew to Managua finally stepping into the country around 9:30 am on Aug 7 a good day and very little sleep later. Right now I´m pretty sure our sleeping clocks are set to somewhere in Europe. We´re going to sleep soon and it´s only 7:30 pm here 6:30 back home. Check next post for the adventure from the airport to Leon, Nicaragua and our hostel.